The coder includes a header comment block at the top of the files it generates. The header comment block contains the specifications of the generating filter and the coder options that were selected at the time HDL code was generated. -- Generated by MATLAB(R) 7.11 and the Filter Design HDL Coder 2.7. Select the Global Settings tab on the Generate HDL dialog box. Select the General tab in the Additional settings pane. Type the comment text in the Comment in header field, as shown in the following figure. Command-Line Alternative: Use the generatehdl function with the property UserComment to add a comment to the end of the header comment block in each generated HDL file. 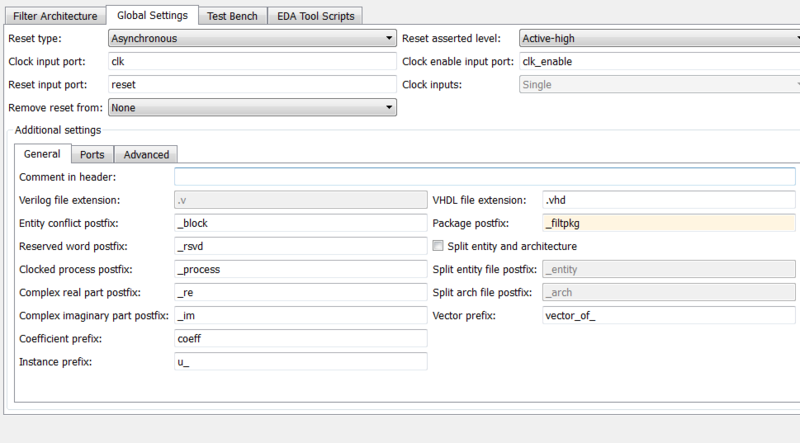 The coder checks whether multiple entities in VHDL or multiple modules in Verilog share the same name. If a name conflict exists, the coder appends the postfix '_block' to the second of the two matching character vectors. Enter a new character vector in the Entity conflict postfix field, as shown in the following figure. Command-Line Alternative: Use the generatehdl function with the property EntityConflictPostfix to change the entity or module conflict postfix. The coder checks whether character vectors that you specify as names, postfix values, or labels are VHDL or Verilog reserved words. See Reserved Word Tables for listings of VHDL and Verilog reserved words. If you specify a reserved word, the coder appends the postfix _rsvd to the character vector. For example, if you try to name your filter mod, for VHDL code, the coder adds the postfix _rsvd to form the name mod_rsvd. Enter a new character vector in the Reserved word postfix field, as shown in the following figure. Command-Line Alternative: Use the generatehdl function with the property ReservedWordPostfix to change the reserved word postfix. The following tables list VHDL and Verilog reserved words. Specify a new value in the Package postfix field. When specifying a character vector for use as a postfix in file names, consider the size of the base name and platform-specific file naming requirements and restrictions. Command-Line Alternative: Use the generatehdl function with the PackagePostfix property to rename the file name postfix for VHDL package files. The coder declares the coefficients for the filter as constants within a rtl architecture. The coder derives the constant names adding the prefix coeff. The coefficient names depend on the type of filter. Each coefficient number, starting with 1. An underscore (_) and an a or b coefficient name (for example, _a2, _b1, or _b2) followed by _sectionn, where n is the section number. Enter a new character vector in the Coefficient prefix field, as shown in the following figure. Cannot include a double underscore (__). If you specify a VHDL or Verilog reserved word, the coder appends a reserved word postfix to the character vector to form a valid identifier. If you specify a prefix that ends with an underscore, the coder replaces the underscore character with under. For example, if you specify coef_, the coder generates coefficient names such as coefunder1. Command-Line Alternative: Use the generatehdl function with the property CoeffPrefix to change the base name for filter coefficients. The coder generates process blocks to modify the content of the registers. The label for each of these blocks is derived from a register name and the postfix _process. For example, the coder derives the label delay_pipeline_process in the following block from the register name delay_pipeline and the postfix '_process'. Enter a new character vector in the Clocked process postfix field, as shown in the following figure. Command-Line Alternative: Use the generatehdl function with the property ClockProcessPostfix to change the postfix appended to process labels. Instance prefix specifies a character vector to be prefixed to component instance names in generated code. The default is 'u_'. Enter a new character vector in the Instance prefix field, as shown in the following figure. Command-Line Alternative: Use the generatehdl function with the property InstancePrefix to change the instance prefix. Vector prefix specifies a character vector to be prefixed to vector names in generated VHDL code. The default is 'vector_of_'. Vector prefix is not supported for Verilog code generation. Enter a new character vector in the Vector prefix field, as shown in the following figure. Command-Line Alternative: Use the generatehdl function with the property VectorPrefix to change the instance prefix.